Based on visual observations, KVERT reported that on 17 September explosions at Zhupanovsky generated gas-and-steam plumes with small amounts of ash that rose to altitudes of 6-7 km (19,700-23,000 ft) a.s.l. and drifted 20 km SW. The Aviation Color Code was raised from Green to Orange, the second highest level on a 4-color scale. About 30 minutes later satellite images showed ash plumes drifting 10 km E. Later that day gas-and-steam plumes rose 4 km (13,100 ft) a.s.l. The Aviation Color Code was lowered to Yellow, and then on 20 September it was lowered to Green. A brief eruption that began on 23 October 2013 was the first reported activity at Zhupanovsky since 1959 (BGVN 39:09). After another eight months of quiet, eruptive activity began again in early June 2014 that was characterized by periods of frequent, moderate, ash-generating explosions that continued through the end of that year (BGVN 39:09). As described below, similar activity continued from January 2015 through 24 March 2016, with periods of strong explosions generating ash plumes as high as 10 km altitude. Another long period of eight months without observed activity was broken by a large eruption on 20 November 2016. No additional activity was reported through March 2017. Most of the data comes from Kamchatka Volcanic Eruption Response Team (KVERT) reports. Often, the volcano is obscured by clouds. All reported dates are UTC unless otherwise noted (local = -12 hours). Activity during 2015. According to KVERT, the moderate eruption with explosions generating ash plumes continued into 2015 (table 1). The Aviation Color Code remained Orange (third level on a four-color scale) between 1 January and 15 May 2015. After an explosion on 3 April, explosive activity waned and KVERT lowered the Aviation Color Code from Orange to Yellow (second level on a four-color scale) on 16 May. On 9 June 2015, activity increased again, with webcam and satellite images showing an ash plume rising to an altitude of 6 km. The Aviation Color Code was raised on 8 June to Orange. During an overflight on 16 July, volcanologists observed fresh deposits at the foot of the volcano from collapses of the S section of the active Priemysh Crater that likely occurred on 12 July (figures 7 and 8). Moderate activity at the crater continued through 17 July; the Aviation Color Code was lowered to Yellow on 18 June and to Green on 23 July. Figure 7. Photo of the summit area of Zhupanovsky showing the collapse deposits from the Priemysh cone, 16 July 2015. Photo credit to A. Plechova and V.I. Vernadsky, IGAC RAS. Courtesy of Institute of Volcanology and Seismology FEB RAS, KVERT. Figure 8. Photo of the southern side of Zhupanovsky showing the collapse deposits from the Priemysh cone, 16 July 2015. Photo credit to A. Plechova and V.I. Vernadsky, IGAC RAS. Courtesy of Institute of Volcanology and Seismology FEB RAS, KVERT. On 7 August KVERT reported that explosive activity had ended, but collapses of the S part of the active crater continued. On 6 August ash plumes rose to an altitude of 5 km and drifted 25-60 km SW, triggering KVERT to raise the Aviation Color Code to Yellow. The code was lowered back to Green on 13 August. KVERT indicated that activity remained low until 27 November 2015 when, based on satellite images, ash plumes rose to altitudes of 5-6 km and drifted 285 km E. The Aviation Color Code was raised to Orange. IVS FED RAS (Institute Volcanology and Seismology Far East Division of the Russian Academy of Sciences) observers noted an ash explosion at 0356 on 30 November (UTC); the Tokyo Volcanic Ash Advisory Center (VAAC) reported that the resulting ash plume rose to an altitude of 9 km. Pyroclastic flow deposits 15.5 km long were observed on the S flank after the 30 November event. According to KVERT, activity decreased after a partial collapse of the S central sector on 27 and 30 November 2015. Satellite images detected a very weak thermal anomaly over the volcano on 4 and 7 December. Moderate levels of fumarolic activity continued. On 10 December the Aviation Color Code was lowered to Yellow. By early-to-mid December 2015, only moderate levels of fumarolic activity were observed. On 17 December the Aviation Color Code was lowered to Green. KVERT reported that thermal anomalies occurred frequently during the reporting period; often they were obscured by clouds. The only MODVOLC thermal alerts, based on MODIS anomalies, during the reporting period were during March-June 2015: on 7 March, 8 March (2 pixels), 15 March (2 pixels), 21 March (2 pixels), 20 May, and 16 June. Table 1. Summary of reported activity at Zhupanosky, January 2015-March 2016. Data is from webcam images, satellite images, and visual observations. On many days, clouds obscured visibility. Courtesy of KVERT and Tokyo VAAC. 2016 Feb 12-13 7; 10; 1 2 km E; 50-200 km SE, E; 600 km E, NE; 288 km ESE 12-13 Feb Aviation Color Code raised to Red. Activity during 2016. The eruption pattern of fluctuating activity levels continued into 2016. Based on visual observations, KVERT reported that at 1636 on 19 January 2016 (UTC), an explosion generated an ash plume that rose to an altitude of 7-8 km and drifted 20 km E (figure 9). The Aviation Color Code was raised to Orange. Figure 9. Photo of the ash column rising from Zhupanovsky, 19 January 2016. Still image taken from webcam video. Courtesy of Institute of Volcanology and Seismology FEB RAS, KVERT. Moderate steam-and-gas activity continued during 5 February-18 March. An explosion at 2029 on 12 February (UTC) was recorded by a video camera and generated an ash plume that rose to an altitude of 7 km and drifted E. A larger explosion visually observed a minute later generated an ash plume that rose to an altitude of 10 km and drifted 50 km SE. The Aviation Color Code was raised to Red for several hours. In a report issued at 2334 (UTC), KVERT noted that only moderate amounts of gas and steam rose from the volcano; the Aviation Color Code was lowered to Orange. Ash from the earlier explosions drifted E over Kronotsky Bay and NW. A few hours later, an ash plume was detected in satellite images rising 1 km above the volcano and drifting 288 km E.
The Tokyo VAAC recorded an explosion at 1320 on 24 March (UTC) that generated an ash plume which rose to an altitude of 8 km. After the explosion, no further activity was observed. A very weak thermal anomaly was detected over the volcano in satellite images on 1 and 10 April. The Aviation Color Code was thus lowered to Yellow on 13 April. The last thermal anomaly detection in a satellite image was on 10 April. However, moderate fumarolic activity continued. The Aviation Color Code was lowered to Green on 16 June. At 1429 on 20 November 2016 a webcam recorded ash plumes rising to altitudes of 6-8 km and drifting 73 km E (figure 10); the Aviation Color Code was raised from Green to Orange. No further activity was observed, and on 22 November the Aviation Color Code was lowered to Yellow. Figure 10. Photo of the ash column rising from Zhupanovsky and extending E, 20 November 2016. Still image taken from webcam video. Courtesy of Institute of Volcanology and Seismology FEB RAS, KVERT. Information Contacts: Kamchatka Volcanic Eruptions Response Team (KVERT), Far East Division, Russian Academy of Sciences, 9 Piip Blvd., Petropavlovsk-Kamchatsky, 683006, Russia (URL: http://www.kscnet.ru/ivs/kvert/); Institute of Volcanology and Seismology, Far Eastern Branch, Russian Academy of Sciences, (IVS FEB RAS), 9 Piip Blvd., Petropavlovsk-Kamchatsky 683006, Russia (URL: http://www.kscnet.ru/ivs/eng/); Tokyo Volcanic Ash Advisory Center (VAAC), 1-3-4 Otemachi, Chiyoda-ku, Tokyo, Japan (URL: http://ds.data.jma.go.jp/svd/vaac/data/); Hawai'i Institute of Geophysics and Planetology (HIGP), MODVOLC Thermal Alerts System, School of Ocean and Earth Science and Technology (SOEST), Univ. of Hawai'i, 2525 Correa Road, Honolulu, HI 96822, USA (URL: http://modis.higp.hawaii.edu/). KVERT reported that at 1429 on 20 November a webcam recorded ash plumes from Zhupanovsky rising to altitudes of 6-8 km (19,700-26,200 ft) a.s.l. and drifted 73 km E. The Aviation Color Code was raised from Green to Orange, the second highest level on a 4-color scale. KVERT noted that conditions were quiet after the eruption; on 22 November the Aviation Color Code was lowered to Yellow. KVERT reported that moderate activity at Zhupanovsky continued during 25 March-1 April. The Aviation Color Code remained at Orange. KVERT reported that moderate activity at Zhupanovsky continued during 18-25 March. According to KVERT, the Tokyo VAAC noted that an explosion generated an ash plume that rose to an altitude of 8 km (26,200 ft) a.s.l. at 0120 on 25 March. An 8 x 10 km ash cloud observed in satellite images drifted about 135 km NW at altitudes of 3.5-4 km (11,500-13,100 ft) a.s.l. that same day. The Aviation Color Code remained at Orange. KVERT reported that moderate gas-and-steam activity at Zhupanovsky continued during 11-18 March. The Aviation Color Code remained at Orange. KVERT reported that moderate gas-and-steam activity at Zhupanovsky continued during 4-11 March. The Aviation Color Code remained at Orange. KVERT reported that moderate gas-and-steam activity at Zhupanovsky continued during 26 February-4 March. The Aviation Color Code remained at Orange. KVERT reported that moderate gas-and-steam activity at Zhupanovsky continued during 19-26 February. The Aviation Color Code remained at Orange. KVERT reported that moderate activity at Zhupanovsky continued during 12-19 February. On 12 February explosions generated ash plumes that rose to an altitude of 10 km (32,800 ft) a.s.l. During 12-13 February satellite images detected a thermal anomaly and ash plumes that drifted 600 km E and NE. The Aviation Color Code remained at Orange. KVERT reported that moderate steam-and-gas activity at Zhupanovsky continued during 5-12 February. Explosions on 5, 7, and 9 February generated ash plumes detected in satellite images that drifted over 545 km E and N. A thermal anomaly was detected during 5 and 9-11 February. An explosion at 0929 on 13 February was recorded by a video camera and generated an ash plume that rose to an altitude of 7 km (23,000 ft) a.s.l. and drifted E. A larger explosion visually observed a minute later generated an ash plume that rose to an altitude of 10 km (32,800 ft) a.s.l. and drifted 50 km SE. The Aviation Color Code was raised to Red. In a report issued at 1134, KVERT noted that only moderate amounts of gas and steam rose from the volcano; the Aviation Color Code was lowered to Orange. Ash from the earlier explosions drifted E over Kronotsky Bay and NW. A few hours later an ash plume was detected in satellite images rising 1 km above the volcano and drifting 288 km E.
KVERT reported that moderate steam-and-gas activity at Zhupanovsky continued during 29 January-5 February. A thermal anomaly was detected in satellite images on 30 January. The Aviation Color Code remained at Orange. KVERT reported that moderate activity at Zhupanovsky continued during 22-29 January. A thermal anomaly was detected in satellite images on 23 January. Explosions on 24 January generated ash plumes that rose to an altitude of 8 km (26,200 ft) a.s.l. and drifted over 235 km NNE. The Aviation Color Code remained at Orange. Based on visual observations, KVERT reported that on 21 January explosions at Zhupanovsky generated ash plumes that rose to an altitude of 8 km (26,200 ft) a.s.l. and drifted 36 km W. A thermal anomaly was detected in satellite images. The Aviation Color Code remained at Orange (the second highest on a four-color scale). Based on visual observations, KVERT reported that at 1636 on 19 January an explosion at Zhupanovsky generated an ash plume that rose to altitudes of 7-8 km (23,000-26,200 ft) a.s.l. and drifted 20 km E. The Aviation Color Code was raised to Orange (the second highest on a four-color scale). KVERT reported that an explosive eruption that began at Zhupanovsky on 6 June likely finished on 30 November. Only moderate levels of fumarolic activity was observed in early-to-mid December. On 17 December the Aviation Color Code was lowered to Green. KVERT reported quiet conditions at Zhupanovsky after a partial collapse of the S central sector on 27 and 30 November. Satellite images detected a very weak thermal anomaly over the volcano on 4 and 7 December. Moderate levels of fumarolic activity continued. On 10 December the Aviation Color Code was lowered to Yellow. KVERT reported moderate eruptive activity at Zhupanovsky during 27 November-4 December. Explosions on 27 and 30 November generated ash plumes that rose to altitudes of 6-7 km (19,700-23,000 ft) a.s.l. and drifted 300 km E and SE. Pyroclastic flow deposits 15.5 km long were observed on the S flank after the 30 November event. Weak thermal anomalies were detected in satellite images over the crater on both of those days, and in the area of the pyroclastic flow deposits on 30 November and 3 December. Based on satellite images, KVERT reported that on 28 November ash plumes from Zhupanovsky rose to altitudes of 5-6 km (16,400-19,700 ft) a.s.l. and drifted 285 km E. The Aviation Color Code was raised to Orange. IVS FED RAS (Institute Volcanology and Seismology Far East Division of the Russian Academy of Sciences) observers noted an ash explosion at 0356 on 1 December; the Tokyo VAAC reported that the resulting ash plume rose to an altitude of 9 km (29,500 ft) a.s.l. and drifted 60 km SE. On 7 August KVERT reported that explosive activity at Zhupanovsky had finished but collapses of the S part of the active crater continued. On 6 August ash plumes rose to an altitude of 5 km (16,400 ft) a.s.l. and drifted 25-60 km SW. The Aviation Color Code was raised to Yellow. KVERT reported that moderate explosive activity at Zhupanovsky continued during 10-17 July. A strong explosion on 12 July produced an ash plume that rose to an altitude of 10 km (32,800 ft) a.s.l. and drifted 1,200 km E. Ashfall was reported in Petropavlovsk-Kamchatsky. Another explosion on 14 July generated ash plumes that rose to an altitude of 2 km (6,600 ft) a.s.l. and drifted SW and 60 km S. During an overflight on 16 July, volcanologists observed fresh deposits at the foot of the volcano from collapses of the S section of Priemysh Crater (the active crater) that likely occurred on 12 July. Moderate activity at the crater continued through 19 July; the Aviation Color Code was lowered to Yellow. KVERT reported that explosive activity at Zhupanovsky probably continued during 3-10 July; ash plumes drifted SW on 6 July. Weather clouds obscured views of the volcano on the other days. The Aviation Color Code remained at Orange. KVERT reported that explosive activity at Zhupanovsky probably continued during 26-3 July; weather clouds obscured views of the volcano. The Aviation Color Code remained at Orange. KVERT reported that explosive activity at Zhupanovsky probably continued during 19-26 June; weather clouds obscured views of the volcano. The Aviation Color Code remained at Orange. KVERT reported that explosive activity at Zhupanovsky continued during 12-19 June. Weak steam-and-gas activity was observed on 14 June. Satellite images showed a thermal anomaly over the volcano on 16 June, as well as an ash cloud drifting 150 km W. The Aviation Color Code remained at Orange. KVERT reported that explosive activity at Zhupanovsky continued during 5-12 June; ash plumes rose to an altitude of 6 km (a.s.l.) during 7-9 June. Satellite images showed a thermal anomaly over the volcano during 8-9 June, and ash clouds drifting 250 km SE on 9 June. The Aviation Color Code remained at Orange. On 9 June KVERT reported that the moderate explosive eruption at Zhupanovsky continued; a webcam and satellite images showed an ash plume rising to an altitude of 6 km (19,700 ft) a.s.l. and drifting 30 km S. The Aviation Color Code was raised to Orange. On 16 May KVERT reported that the explosive eruption that began at Zhupanovsky on 6 June 2014 ended at the beginning of April 2015. The last ash plume occurred on 3 April, although weak thermal anomalies continued to be detected. The Aviation Color Code was lowered to Yellow. On 20 May an ash plume drifted 470 km E.
KVERT reported that weak activity continued at Zhupanovsky during 8-15 May. Satellite images detected a weak thermal anomaly over the volcano on 14 May; cloud cover prevented observations on the other days. The Aviation Color Code remained at Orange. KVERT reported that moderate activity continued at Zhupanovsky during 1-8 May. Satellite images detected a thermal anomaly over the volcano on 3 and 5 May. The Aviation Color Code remained at Orange. KVERT reported that strong gas-and-steam activity was observed at Zhupanovsky during 10-17 April. A thermal anomaly over the volcano was observed in satellite images during 16-17 and 23 April; cloud cover obscured views during 18-22 and 24 April. The Aviation Color Code remained at Orange. KVERT reported that a moderate explosive eruption at Zhupanovsky continued during 3-10 April. Satellite images detected ash plumes drifting 25 km SE on 3 April and a thermal anomaly over the volcano on 9 April. The Aviation Color Code remained at Orange. KVERT reported that a moderate explosive eruption at Zhupanovsky continued during 27 March-3 April. Satellite images detected a thermal anomaly over the volcano on 26 and 30 March, and 2 April. The Aviation Color Code remained at Orange. KVERT reported that a moderate explosive eruption at Zhupanovsky continued during 20-27 March. Based on observers and webcam recordings, explosions produced ash plumes that rose to an altitude of 8 km (26,200 ft) a.s.l. on 25 March and drifted more than 100 km ENE. A daily thermal anomaly was detected in satellite images. The Aviation Color Code remained at Orange. KVERT reported that a moderate explosive eruption at Zhupanovsky continued during 6-13 March. Two strong explosions on 7 and 8 March generated ash plumes that rose to altitudes of 6-7 km (19,700-23,000 ft) a.s.l. Satellite images detected ash plumes drifting 333 km E on 7 and 10 March, and 232 km NE on 8 March. A thermal anomaly was also detected during 7-10 March. The Aviation Color Code remained at Orange. KVERT reported that a moderate explosive eruption at Zhupanovsky continued during 27 February-6 March. Satellite images detected a thermal anomaly over the volcano during 27 February, and 1 and 4 March. Ash clouds rose to altitudes of 3-8 km (10,000-26,200 ft) a.s.l. and drifted over 400 km E. The Aviation Color Code remained at Orange. KVERT reported that a moderate explosive eruption at Zhupanovsky continued during 20-27 February. Satellite images detected a thermal anomaly over the volcano during 20-22 and 25-26 February. Ash clouds rose to altitudes of 3-3.5 km (10,000-11,500 ft) a.s.l. and drifted about 250 km E and SE. The Aviation Color Code remained at Orange. KVERT reported that a moderate explosive eruption at Zhupanovsky continued during 13-20 February. Satellite images detected a thermal anomaly over the volcano during 14-15 and 18 February. Ash clouds rose to altitudes of 3-3.5 km (10,000-11,500 ft) a.s.l. and drifted over 200 km W during 15-16 February and SE during 17-19 February. The Aviation Color Code remained at Orange. KVERT reported that a moderate explosive eruption at Zhupanovsky continued during 6-13 February. Satellite images detected a daily thermal anomaly over the volcano. Ash clouds rose to an altitude of 3 km (10,000 ft) a.s.l. and drifted about 65 km W on 6 and 9 February. The Aviation Color Code remained at Orange. KVERT reported that a moderate eruption at Zhupanovsky continued during 30 January-6 February. Satellite images detected a daily thermal anomaly over the volcano. The Aviation Color Code remained at Orange. KVERT reported that a moderate explosive eruption at Zhupanovsky continued during 23-30 January. Satellite images detected ash plumes drifting 160 km SW and SE at altitudes of 5-6 km (16,400-19,700 ft) a.s.l. during 22 and 25-26 January, and a thermal anomaly over the volcano during 23 and 25-27 January. The Aviation Color Code remained at Orange. KVERT reported that a moderate explosive eruption at Zhupanovsky continued during 16-23 January. Satellite images detected a thermal anomaly over the volcano during 17-20 January, and ash plumes drifting 300 km SW and E during 17-21 January. The Aviation Color Code remained at Orange. KVERT reported that a moderate explosive eruption at Zhupanovsky continued during 9-16 January. Pilots observed ash clouds rising to an altitude of 5 km (16,400 ft) a.s.l. on 11 January. Satellite images detected ash plumes drifting 40 km SW during 11-12 January, and a thermal anomaly over the volcano on 12 January. The Aviation Color Code remained at Orange. KVERT reported that a moderate eruption at Zhupanovsky continued during 2-9 January. Satellite images detected ash plumes drifting 50 km E on 6 January. The Aviation Color Code remained at Orange. 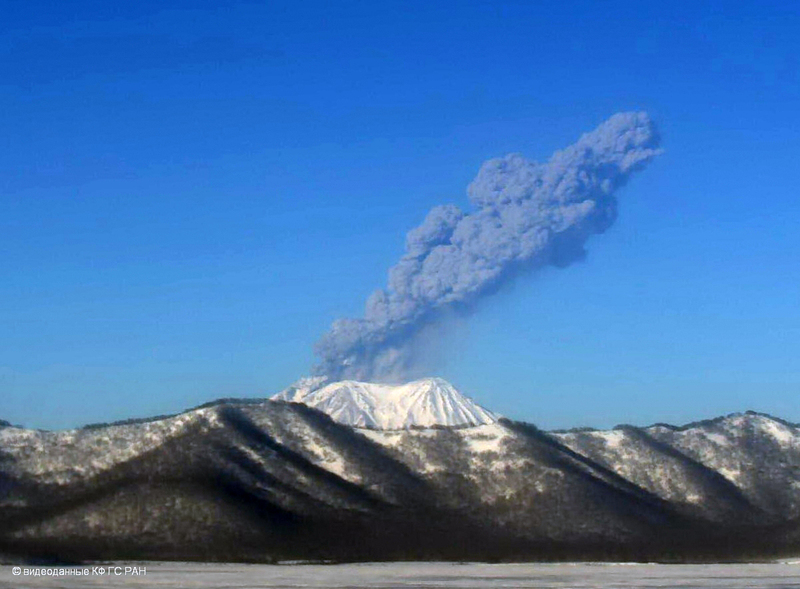 KVERT reported that an eruption at Zhupanovsky continued during 27 December-4 January. Local airline pilots observed explosions and ash plumes that rose to altitudes of 6-9 km (19,700-29,500 ft) a.s.l. on 29 December. That same day ash plumes were observed in satellite images drifting 75 km ENE. The Aviation Color Code remained at Orange. KVERT reported that an eruption at Zhupanovsky likely continued during 19-26 December. Intense steam-and-gas emissions were observed on 24 December. The Aviation Color Code remained at Orange. 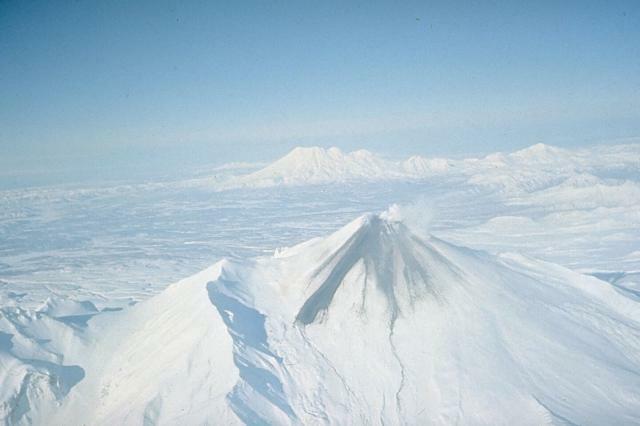 KVERT reported that an eruption at Zhupanovsky continued during 12-19 December. Satellite images detected an ash plume drifting 70 km SE on 15 December and intense steam-and-gas emissions on 17 December. The Aviation Color Code remained at Orange. KVERT reported that an eruption at Zhupanovsky continued during 5-12 December. Satellite images detected a thermal anomaly on 9 December; the volcano was either quiet or obscured by clouds on the other days. The Aviation Color Code remained at Orange. KVERT reported that ash explosions at Zhupanovsky continued during 25 November-1 December. Ash plumes rose to an altitude of 6 km (19,700 ft) a.s.l. and drifted 422 km E and SE during 28 November-1 December. Satellite images detected a thermal anomaly during 28-29 November; the volcano was either quiet or obscured by clouds on the other days. The Aviation Color Code remained at Orange. KVERT reported that strong explosions at Zhupanovsky were detected at 0206 on 23 November and 1214 on 25 November. Ash plumes rose to altitudes of 7-8 km (23,000-26,200 ft) a.s.l. and drifted 350 km E on 22 November and SE during 25-27 November. Satellite images detected a thermal anomaly over the volcano on 22, 25, and 27 November; cloud cover prevented views of the volcano on the other days. The Aviation Color Code remained at Orange. KVERT reported that a moderate explosive eruption at Zhupanovsky likely continued during 14-21 November. Satellite images showed that the volcano was either quiet or obscured by clouds. The Aviation Color Code remained at Orange. KVERT reported that moderate explosive eruptions at Zhupanovsky likely continued during 7-14 November. Satellite images detected ash plumes drifting 270 km SE during 7-10 November. The Aviation Color Code remained at Orange. KVERT reported that a strong explosive eruption at Zhupanovsky occurred at 0955 on 8 November, generating an ash plume that rose to an altitude of 10 km (32,800 ft) a.s.l. and drifted 26 km SSW. The Aviation Color Code was raised to Orange. On 9 November ash plumes detected in satellite images rose to altitudes of 3-4 km (9,800-13,100 ft) a.s.l. and drifted 190-250 km SE. KVERT reported that the eruption at Zhupanovsky had likely finished in mid-October; satellite images last detected an explosion on 11 October and a thermal anomaly on 12 October. Volcanologists conducting an overflight on 17 October observed only gas-and-steam activity from the active crater. The Aviation Color Code was lowered to Yellow. KVERT reported that an eruption at Zhupanovsky likely continued during 17-24 October. Satellite images were obscured by clouds. The Aviation Color Code remained at Orange. KVERT reported that an explosive eruption at Zhupanovsky continued during 10-17 October. Satellite images detected a thermal anomaly on the volcano during 10-12 October, and ash plumes that rose to an altitude of 9 km (29,500 ft) a.s.l. on 11 October and drifted 411 km NE during 11-12 October. Cloud cover prevented satellite views of the volcano on the other days. The Aviation Color Code remained at Orange. KVERT reported that an explosive eruption at Zhupanovsky continued during 3-10 October. Satellite images detected a thermal anomaly on 3 and 9 October; cloud cover prevented views of the volcano on the other days. The Aviation Color Code remained at Orange. KVERT reported that an explosive eruption at Zhupanovsky continued during 26 September-3 October. Satellite images detected a thermal anomaly on 27 September, and ash plumes that rose to altitudes of 4-4.5 km (13,000-14,800 ft) a.s.l. and drifted 205 km E on 28 September. The Aviation Color Code remained at Orange. KVERT reported that an explosive eruption at Zhupanovsky continued during 19-26 September. Ground-based observers noted ash plumes drifting SW to Avachinsky Bay during 23-24 September. Satellite images detected a thermal anomaly during 18 and 23-24 September, as well as ash plumes that rose to altitudes of 3.5-4 km (11,500-13,000 ft) a.s.l. and drifted 80 km SW and NE during 23-24 September. The Aviation Color Code remained at Orange. KVERT reported that an explosive eruption at Zhupanovsky continued during 12-19 September. Volcanologists in Nalychevo Valley observed short-duration explosions on 13 September which generated ash plumes that rose to altitudes of 3.5-4 km (11,500-13,000 ft) a.s.l. and drifted E. Satellite images detected a daily thermal anomaly and ash plumes that rose to altitudes of 3.5-4 km (11,500-13,000 ft) a.s.l. and drifted 220 km SE and S during 13-14 and 16 September. The Aviation Color Code remained at Orange. KVERT reported ashfall from Zhupanovsky in the area of IVS FEB RAS (Petropavlovsk-Kamchatsky) during 1100-1300 on 7-8 September. The moderate explosive eruption continued and Alert Level Orange was maintained through the week of 12 September. 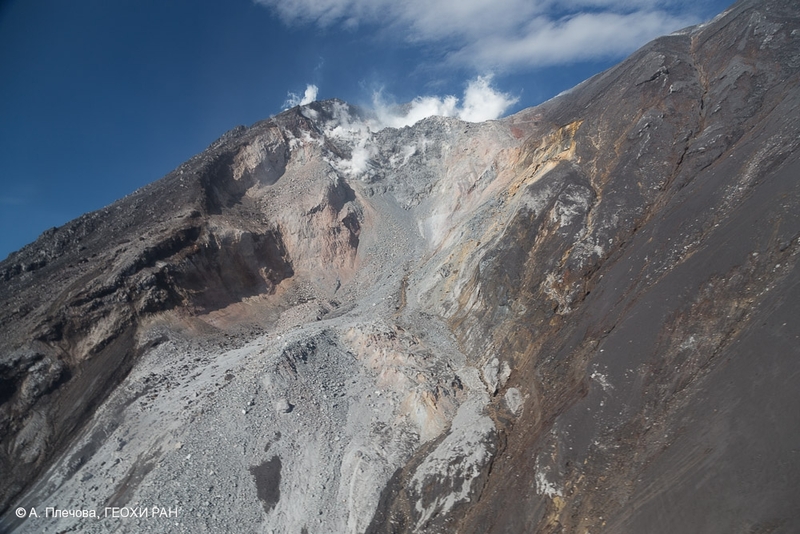 According to visual data, ash plumes extended about 50 and 70 km S and SE of the volcano on 10 and 11 September, respectively. Persistent thermal anomalies were detected from the summit area based on satellite images during 4-5 and 10-11 September. Satellite data showed ash plumes up to 3.5-4.0 km (11,500-13,100 ft) a.s.l. mainly during 9-11 September, and ash plumes drifted about 1,113 km SE and S.
According to the Tokyo VAAC, ash plumes were detected by satellite images during 10-16 September with the exception of 15 September. Plume heights were 2,400-3,700 m (8,000-12,000 ft) a.s.l.. According to KVERT, the moderate explosive eruption of Zhupanovsky continued and Alert Level Orange was maintained through 8 September. On 1 September visual data detected an ash plume to an altitude of 3,500 m (11,500 ft) a.s.l. drifting NW of the volcano. Satellite data showed ash plumes at 3,500-4,000 m (11,500-13,100 ft) a.s.l. that extended about 85 km in various directions on 28 and 30 August and 1-4 September. Persistent thermal anomalies were detected from the summit area based on satellite images. KVERT reported three ash plumes drifting SW on 7 September. The plumes were 10 km, 38 km, and 72 km long at 2,500-3,000 m (8,200-9,840 ft) a.s.l. On 8 September, satellite images revealed an ash plume extending 52 km SW from the volcano. According to the Tokyo VAAC, ash plumes and possible ash plumes were detected by satellite images during 29 August-9 September with the exception of 5 and 6 September. Plume heights were 2,700-11,600 m (9,000-38,000 ft) a.s.l..
KVERT reported that during 22-28 August the moderate explosive eruption continued at Zhupanovsky. On 28 August ash plumes rose to 3.5-4 km (11,500-13,100 ft) a.s.l. and drifted 80 km SW. During 25-27 August satellite data showed a thermal anomaly over the volcano, but clouds prevented observations the other days of the week. The Tokyo VAAC reported that ash plumes rose to 4.3 km (14,000 ft) a.s.l. and drifted SW.
KVERT reported that during 15-21 August that moderate explosive eruption continued at Zhupanovsky. Satellite data showed a thermal anomaly over the volcano on 16-17 August. On 18 and 15 August the volcano was obscured by clouds. The Tokyo VAAC reported ash plumes rose to 3-4.5 km (10,000-15,000 ft) a.s.l. and drifted S and SSE. On August 19 KVERT reported that satellite data showed ash plumes drifted 51 km S of the volcano and on August 20 that ash plumes rose to 3 km (9800 ft) a.s.l. and drifted 110 km SSE. KVERT reported that during 8-14 August the moderate explosive eruption continued at Zhupanovsky. On 8 August staff of Volcanoes of Kamchatka Natural Park observed ash explosions twice an hour, with ash plumes rising up to 4 km (13,100 ft)a.s.l. drifting E. On 8 and 11-13 August satellite data showed that ash plumes rose to 4-4.5 km (13,100-14,800 ft)a.s.l. and drifted 80-100 km SE and NE Other days satellite data showed the volcano was obscured by clouds. On 12-13 August the Tokyo VAAC reported ash plumes to 3-4.9 km (10,000-16,000 ft) a.s.l that drifted SE, NE, and ESE. KVERT reported that during 1-7 August that the moderate explosive eruption continues at Zhupanovsky. On 6 August, KVERT reported an ash plume drifting 260 km ENE of the volcano. Most days satellite data showed the volcano was obscured by clouds. KVERT reported that during 25 July-1 August the moderate explosive eruption continues at Zhupanovsky. On 27 July, satellite data showed ash plumes rose to 4 km (13,100 ft) a.s.l. and extended 150 km N. The volcano was obscured by clouds 25 July-1 August. On 30 July Tokyo VAAC reported an ash plume rose 5.2 km (17,000 ft) a.s.l. and drifted W.
KVERT reported that during 19-25 July the moderate explosive eruption continued at Zhupanovsky. On 18 and 21 July satellite data showed ash plumes that rose to 4 km (13,100 ft) a.s.l. and extended about 30 and 70 km NE, respectively. A thermal anomaly was observed over the volcano on 19 and 21 July. Tokyo VAAC reported an ash plume on 27 July that rose to 8.5 km (28,000 ft) a.s.l. and drifted N.
KVERT reported that on 15 July moderate gas-and-steam activity was observed at Zhupanovsky. On 16-17 July satellite data showed ash plumes that rose to 6-6.5 km (19,700-21,300 ft) a.s.l. and extended about 370 km N. A thermal anomaly was observed over the volcano on 16 July. The Tokyo VAAC reported ash plumes during 16-18 and 21 July drifting N and NE. Plume altitudes were in the range of 3.3-8.5 km (11,000-28,000 ft) a.s.l. KVERT reported that during 2, 5, and 9 July, moderate gas-and-steam activity was observed at Zhupanovsky. An ash plume up to 6 km (19,700 ft) a.s.l. was observed on 9 July. Satellite data showed an ash plume extending up to 450 km E and SE of the volcano during 9-10 July. The Aviation Color Code was maintained at Orange. KVERT reported that during 20-26 June, moderate gas-and-steam activity was observed at Zhupanovsky. Satellite data showed ash plumes drifting 55 km NW from the volcano. During June 27-28 cloud cover prevented views from satellite. The Aviation Color Code is Orange. KVERT reported that, during 14-19 June, satellite images over Zhupanovsky detected gas-and-steam plumes with discrete ash plumes up to 4.5 km (14,800 ft) a.s.l. drifting up to 70 km SE and NW from the volcano. Satellite images detected a thermal anomaly on 14-15 and 17-19 June. The Aviation Color Code was raised from Yellow to Orange. Tokyo VAAC reported ash plumes during 18-20 June drifting NW and later NE. Plume heights were in range of 3,000-8,500 m (9,800-28,000 ft) a.s.l. KVERT reported that satellite images over Zhupanovsky detected gas-and-steam plumes drifting 100 km E on 9 and 11 June. Snow in the region was covered by ash. The Aviation Color Code remained at Yellow. KVERT reported that an eruption at Zhupanovsky began on 6 June, producing an ash plume that rose to an altitude of 6 km (19,900 ft) a.s.l., as suggested by Tokyo VAAC and UHPP notices. Cloud cover prevented views from satellite. The Aviation Color Code was raised to Yellow. Satellite images on 9 June showed ash plumes rising to altitudes of 3-4 km (9,800-13,100 ft) a.s.l. and drifting 60 km E.
KVERT reported that a weak thermal anomaly over Zhupanovsky was detected on 23 October. The next day a phreatic eruption began at about 0300 and generated an ash plume that rose 5 km (16,400 ft) a.s.l. The ash plume was visible in satellite images drifting 40 km SE and S. Ash deposits about 10 cm thick were visible at the summit of the central part of the volcano, and deposits about 1 mm thick covered the Nalychevo Valley. The Aviation Color Code was raised to Orange. Ash plumes at 1635 and 2218 rose to altitudes of 2.5-3 km (8,200-10,000 ft) a.s.l. and drifted 120 km ESE and 25 km S, respectively. At 1134 on 25 October an ash plume rose 3 km (10,000 ft) a.s.l. and drifted 20 km NE. On 27 October KVERT noted that strong fumarolic activity and gas emissions continued, but that the phreatic explosions likely had ceased. The Aviation Color Code was lowered to Yellow, and then lowered again to Green on 29 October. On 2 February, fumarolic activity was noted in two vents inside the active crater and two vents to the W (figure 1). Figure 1. Active fumarolic vents at Zhupanovsky, looking roughly E on 2 February 1990. Courtesy of B. Ivanov. 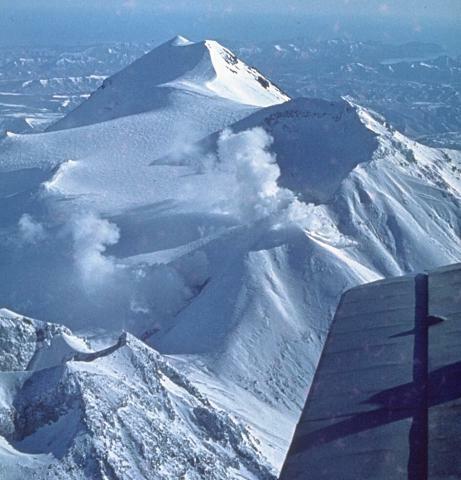 An overflight by members of SVE on 24 August 1993 revealed that significant fumarolic activity was present in the summit area. Fumarolic emissions were coming from the active crater, as well as from other parts of the summit ridge W of the second cone's crater. Yellow sulfur deposits were visible at several locations. On 23 or 24 October 2013 Zhupanovsky erupted for the first time since the 1950's. The report presents the eruptive activity of Zhupanovsky from 23 October 2013 through the end of December 2014. 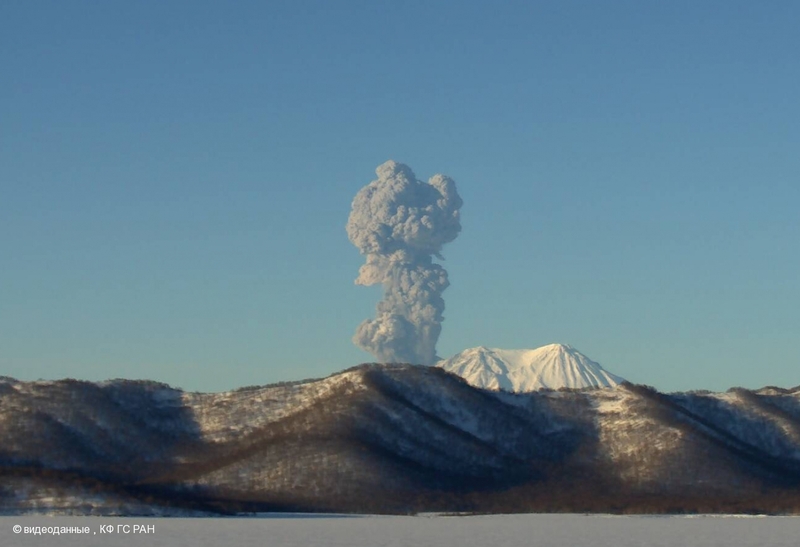 Data were summarized from reports of the Kamchatka Volcanic Eruption Response Team (KVERT), the Tokyo Volcanic Ash Advisory Center (VAAC), and various satellite remote sensors. In addition, observations of activity were recorded by KVERT scientists, park rangers, and aviation personnel. Zhupanovsky lacked in situ scientific monitoring instrumentation. Zhupanovsky's eruptions started on 23 October 2013 and paused during November 2013 through May 2014. The eruptions resumed in June 2014 and Zhupanovsky remained active through the rest of 2014. 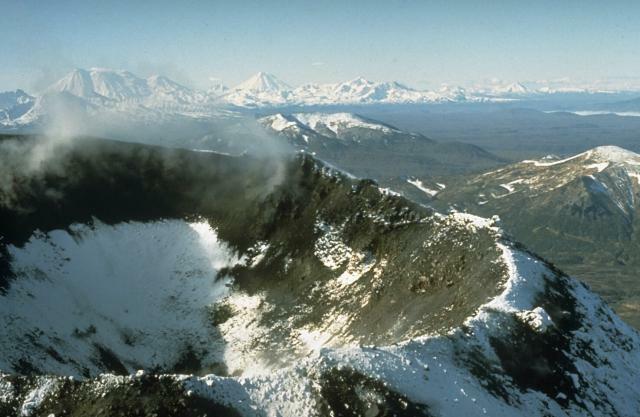 Zhupanovsky lies in a volcanic region on the Kamchatka peninsula (figure 2). It is ~70 km N of the capital, Petropavlovsk-Kamchatsky, a city of ~200,000 inhabitants. Figure 2. (Inset) Map of Russia's E region showing the Kamchatkan peninsula. (Main map) Zhupanovsky (red triangle) lies on the peninsula ~15 km from the Pacific coast shoreline. The city at the yellow dot is Petropavlovsk-Kamchatsky, ~70 km from the edge of Zhupanovsky. This is a Russian map of unknown authorship found online with additions by Bulletin editors. There were two previous Bulletin reports on the volcano, both on fumarolic outgassing, seen during February 1990 (BGVN 15:03) and August 1993 (BGVN 18:08). As further background, Girina and others (2014) summarized Kamchatkan volcanism for the year 2013. There were 30 volcanoes active during the year; three of them (Sheveluch, Klyuchevskoy, and Karymsky) were continuously active. October 2013 eruption. On 23 October 2013, KVERT reported that a weak thermal anomaly occurred over Zhupanovsky. The next day, a phreatic eruption began at about 0300 and generated an ash plume that rose to an altitude of 5 km. The ash plume, visible in satellite images, drifted 120 km SE and S. Ash deposits ~1 mm thick covered the Nalychevo Valley bordering the S of the massif. The Aviation Color Code was raised to Orange. On 26 October 2013, Institute of Volcanology and Seismology (IVS FEB RAS) scientists inspected the summit and found ~10 cm deep ash covered the crater area (figure 3). On 26 October, KVERT stated pilots and ground crew at Elizovo airport observed a gas-and-steam plume that may have contained ash. The plume rose to 1.5 km and drifted E. The airport, 22 km NNW from Petropavlovsk-Kamchatsky, serves commercial airlines and Russian air force planes. On 27 October KVERT noted that strong fumarolic activity and gas emissions continued, but that the phreatic explosions likely had ceased. The Aviation Color Code was lowered to Yellow, and then lowered again to Green on 29 October. Figure 3. (top image) A picture of Zhupanovsky taken on 26 October 2013 below the crater looking ENE. (bottom image) On the same day, a picture taken higher up on the ridge looking into the crater. Courtesy of KVERT. Captured by S. Samoilenko, Institute of Volcanology and Seismology, Russian Academy of Sciences, Far Eastern Branch (IVS FEB RAS). On 5 November 2013, EO-1 satellite's Advanced Land Imager (ALI) captured an ash plume emitted from Zhupanovsky (figure 4). Ash from the 26 October eruption was deposited in the crater area. Earth Observatory analysts interpreted the plume as containing erupted ash, which traveled SE. The plume in figure 4 appears low in density; however, reliable ash detection often requires analysis of spectral data. Figure 4. The Advanced Land Imager (ALI) remote sensor on EO-1 captured this image of Zhupanovsky on 5 November 2013. It shows ash deposited on snow and what was interpreted as a likely ongoing minor ash plume from the summit. In this natural-color image interpreted by NASA Earth Observatory analysts, snow on the high-elevation upper slopes appears white, ash deposits, dark, airborne ash, light gray, and small patches of bare rock, tan. The deep blue N of the crater is the shadow of the NE ridge of the Zhupanovsky massif. Courtesy of NASA Earth Observatory. Annotated by GVP from another version of this image previously captured, processed, and annotated by the NASA EO-1 team and NASA Earth Observatory's Jesse Allen and Robert Simmon. For about seven months (from 7 November 2013 to 5 June 2014), there were no KVERT weekly reports or Tokyo Volcanic Ash Advisory Center (VAAC) reports implying that Zhupanovsky had reverted to a non- eruptive state. Eruption in 2014. On 6 June 2014, an eruption began that consisted of a series of explosions with numerous ash plumes. Throughout the rest of the year (and into 2015) Zhupanovsky remained eruptive. Of acute relevance to plume assessment towards aircraft safety, at least two plumes reached estimated altitudes near 10 km, many ash plumes extended over 100 km, and the longest one documented, near the end of November, rose to 6 km altitude and extended 422 km E to SE (table 1). Table 1. Summary of ash plumes and other activity at Zhupanovsky registered during June-December 2014. Steaming and gas plumes were common but are often omitted here. ACC means Aviation Color Code. Cloud cover prevented observations during many days. The data were taken from KVERT reports and Tokyo VAAC notices. Dates (2014) Ash plume (altitude) Ash plume drift Other information. 6 Jun 6 km -- ACC raised to Yellow. 9 and 11 Jun -- 100 km E Gas-and-steam plumes. 14-20 Jun 3-8.5 km 70 km SE, NW, NE Thermal anomalies. ACC raised to Orange. 2, 5, 9, 10 Jul 6 km 450 km E, SE Gas-and-steam activity on 2 and 4 July, Ash plumes to 6 km on 9 July. An ash plume drift to 450 km SE on10 July. 15-21 Jul 3.3-6.5 km 370 km N, 70 km NE Thermal anomalies. Gas-and-steam plumes. During 16-18 several ash plumes were detected by satellite. 8-13 Aug 3-4.9 km E, SE, NE, ESE up to 100 km Ash explosions twice/hr on 8 Aug. Ash plumes on 11-13 Aug.
15-21 Aug 3-4.5 km 51 km S, 110 km SSE Thermal anomaly. 22-28 Aug 3.5-4.3 km 80 km SW Thermal anomaly. 29 Aug-9 Sep 2.7-11.6 km NW, 85 km various Thermal anomalies. Ash fall on nearby areas. 10-16 Sep 2.4-4 km 50-113 km S, E, 220 km SE Thermal anomalies. 19-26 Sep 3.5-4 km 80 km SW, NE Thermal anomaly. 10-17 Oct 9 km 411 km NE Thermal anomaly. Activity much decreased. Overflight on 17 Oct revealed only gas-and-steam activity. ACC lowered to Yellow. 8 Nov 10 km 26 km SSW Strong explosion. ACC raised to Orange. 14-21 Nov -- -- Volcano either quiet or obscured by clouds. 23-27 Nov 7-8 km 350 km E, SE Strong explosions on 23 and 25 Nov. Thermal anomaly. 28 Nov-1 Dec 6 km 422 km E, SE Thermal anomaly. 5-12 Dec -- -- Volcano either quiet or obscured by clouds. Thermal anomaly. 12-19 Dec -- 70 km SE Intense steam-and-gas emissions on 17 Dec.
19-26 Dec -- -- Intense steam-and-gas emissions on 24 Dec. The Tokyo VAAC monitors volcanoes the Kamchatkan peninsula, detecting and tracking ash plumes through satellite imagery. During 2014, Tokyo VAAC released 176 Zhupanovsky Volcanic Ash Advisories (VAAs), often several per day (up to 5 on some days). During 2014, VAAs discussing Zhupanovsky came out during a total of 54 days. The VAAs identify the satellite, the date and time, the eruption details, and the ash plume velocity. An online archival system on their website furnishes access to the VAAs, enabling retrospective analysis. The Japan Meteorological Agency (JMA) has remained in charge of the East Asia and the Northwest Pacific region since March 1997 in its role as the Tokyo VAAC. VAAs are updated as a minimum at six-hour intervals (normally at 00, 06, 12 and 18 UTC) for as long as ash clouds are identified in satellite imagery. If notable changes occur in ash clouds, the VAA is updated as often as needed. In the event that ash cloud extension is identified in satellite imagery, VAG (Volcanic Ash Graphic) and VAGI (Volcanic Ash Graphic for Initial Distribution) information is also issued. VAAs and these related products are disseminated to airlines, aviation authorities, MWOs and other related organizations through airport branches of JMA and aviation authorities. The Tokyo VAAC archive listed Zhupanovsky VAAs with plume altitudes and movements (table 2). Table 2. A compilation of the Tokyo VAACs archive of Volcanic Ash Advisories (VAAs) relating to Zhupanovsky ash plumes during 2014. Some 2014 images. A Zhupanovsky eruption was captured by the Operational Land Imager (OLI) on Landsat 8 (figure 5). Several OLI images were acquired on 12 September 2014) and put together into the mosaic seen here. In addition to the eruption of Zhupanovsky on the image, four other Kamchatkan volcanoes were emitting plumes, and a forest fire was also burning (figure 5). This time interval is accounted for in table 1 with several small to moderate ash plumes and thermal anomalies during 10-16 September 2014. Table 2 tabulates a VAA issued on 12 September 2014 that documented an ash plume to ~3 km. Figure 5. The Landsat 8 Operational Land Imager captured a consecutive series of images on 12 September 2014 that are mosaicked on this image. The mosaic was made from six images of smaller area. 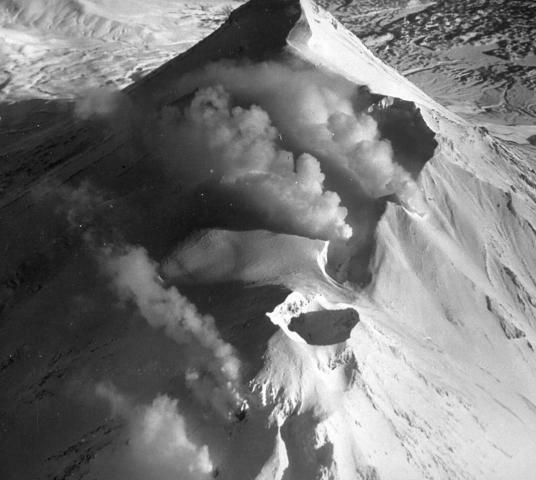 Zhupanovsky and four other volcanoes were emitting plumes. Smoke from a wildfire burned N of Sheveluch. About a year earlier, during 23-25 October 2013, Zhupanovsky deposited ~1 mm of ash in the Nalychevo Valley bordering the S ramparts of Zhupanovsky's E-W ridge. Courtesy of NASA Earth Observatory (Image by Jesse Allen). Annotated by Bulletin editors. Figure 6. A photo taken (at 0015 UTC) on 28 November 2014 showing Zhupanovsky's ash covered slopes and an emerging ash plume. Copyrighted photo by A. Sokorenko, Institute of Volcanology and Seismology FEB RAS. Information Contacts: Kamchatka Volcanic Eruption Response Team (KVERT) (URL: http://www.kscnet.ru/ivs/kvert/index_eng.php); Tokyo Volcanic Ash Advisory Center (VAAC) (URL: http://ds.data.jma.go.jp/svd/vaac/data/ ; Institute of Volcanology and Seismology Russian Academy of Sciences, Far Eastern Branch (IVS FEB RAS), 9 Piip Blvd., Petropavlovsk-Kamchatsky 683006, Russia (URL: http://www.kscnet.ru/ivs/eng/); S. Samoilenko (IVS FEB RAS), and Jesse Allen and Robert Simmon, NASA Earth Observatory (URL: http://earthobservatory.nasa.gov/). The Zhupanovsky volcanic massif consists of four overlapping stratovolcanoes along a WNW-trending ridge. The elongated volcanic complex was constructed within a Pliocene-early Pleistocene caldera whose rim is exposed only on the eastern side. 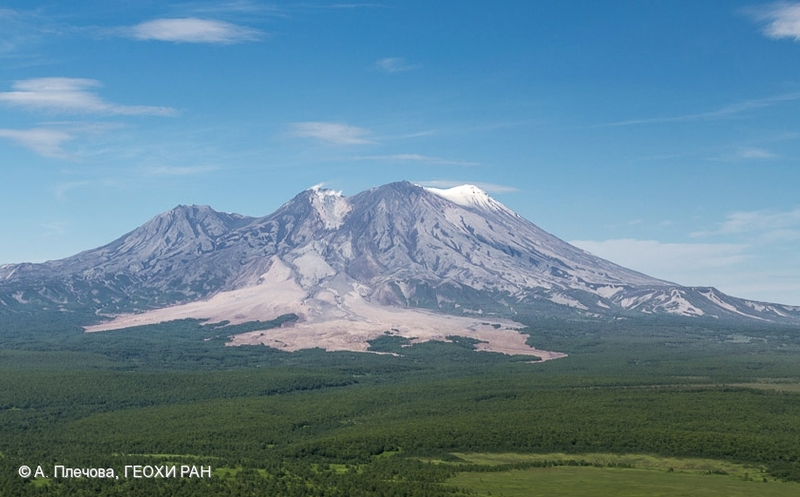 Three of the stratovolcanoes were built during the Pleistocene, the fourth is Holocene in age and was the source of all of Zhupanovsky's historical eruptions. An early Holocene stage of frequent moderate and weak eruptions from 7000 to 5000 years before present (BP) was succeeded by a period of infrequent larger eruptions that produced pyroclastic flows. The last major eruption took place about 800-900 years BP. Historical eruptions have consisted of relatively minor explosions from the third cone. There is no Deformation History data available for Zhupanovsky. Vigorous steam plumes rise from fumaroles on the summit ridge of Zhupanovsky volcano in February 1990. This view from the west shows plumes rising from the flanks of the historically active crater (bottom) and from the ridge above it, which forms the 2nd of Zhupanovsky's four stratovolcanoes. The peak at the top of the photo is the 2958-m-high summit of Zhupanovsky. Photo by B.V. Ivanov, 1990 (Institute of Volcanic Geology and Geochemistry, Petropavlovsk). All four stratovolcanoes forming the WNW-trending Zhupanovsky volcanic massif are seen in this view from the west. The upper peak marks the 2958-m-high summit of the complex, and the ridge below and to the right is the second stratovolcano. Steam rises from the historically active crater at the left center, which caps the third stratovolcano, the only one that was constructed during the Holocene. Historical eruptions have consisted of relatively minor explosions from this crater. The fourth cone (lower left) is the westernmost and lowest. There are no samples for Zhupanovsky in the Smithsonian's NMNH Department of Mineral Sciences Rock and Ore collection. IRIS seismic stations/networks Incorporated Research Institutions for Seismology (IRIS) Data Services map showing the location of seismic stations from all available networks (permanent or temporary) within a radius of 0.18° (about 20 km at mid-latitudes) from the given location of Zhupanovsky. Users can customize a variety of filters and options in the left panel. Note that if there are no stations are known the map will default to show the entire world with a "No data matched request" error notice. Large Eruptions of Zhupanovsky Information about large Quaternary eruptions (VEI >= 4) is cataloged in the Large Magnitude Explosive Volcanic Eruptions (LaMEVE) database of the Volcano Global Risk Identification and Analysis Project (VOGRIPA).